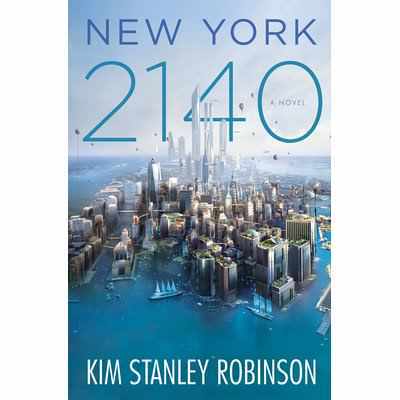 Kim Stanley Robinson’s fascinating and provocative 18th novel New York 2140 is set several decades after two major climate events have raised sea levels hugely. Coastal cities are therefore largely underwater. New York is no exception. Robinson’s characters live co-operatively mostly in one building, the former Met Life skyscraper, but exist in a variety of colliding worlds outside. Solarphysicist: Oh. What a stunningly original idea for a story. Yawn. Robmatic: I’m not aware of any other novels that are set in a future flooded New York. Here’s the thing though, despite Robinson’s just reputation as a (the?) leading climate change novelist, New York 2140 isn’t about climate change really. Or at least it’s about a lot more too. Primarily it’s about economics. It’s a polemic about how and more pertinently why our market based economic systems fail and fail again. (Clue: it’s a feature not a bug.) In this respect a novel set 123 years from now takes on the mantle of a historical novel. Each broad chapter in this 600+ page novel is, like the Met skyscraper, split into units focused on 8 character sets. Mutt and Jeff, coders whose attempted hack on the financial systems precipitates the personal events of the novel; Inspector Gen Octaviasdottir, policewoman who looks into Mutt and Jeff’s disappearance; Charlotte, the lawyer & head of the Met residents; Vlade, building supervisor passionate about his work and nursing a dark past; Franklin, unscrupulous market trader gambling on his algorithms being ahead of the game, and it is a game; Amelia Black, globetrotting cloud sensation with a dirigible from which she films her beloved wildlife; and uneducated 12 year old orphan squatters with impulsive grand ideas Stefan and Roberto. Each has their own interesting things to say about their world. And each we begin to care about as they grow in the novel. This compartmentalised structure maintains the flow of the novel and neatly disguises something. NY2140 is largely a novel with several plots of the conspiracy kind, but almost lacks an overt plot of the story kind. It is episodic with moments of drama (no spoilers but for those who have read it, Amelia’s polar bears is probably the highest drama.) Long time readers of Robinson will be aware that this is what he does frequently. He writes process rather than story in a way that makes the process appear to be the result. NY2140 is a distillation of an approach that has recurred in his novels since Pacific Edge at least. So where much SF is about something going wrong, for Robinson the crisis is a given. Small, personal details go wrong, the overarching crisis is already present. The trick is the tying of the personal to the global somehow. The great collective project has a meaning and it is that of utopia. But the problem of utopia, of collective meaning, is to find an individual meaning. I’m about to state what seems glaringly obvious to me. Almost the entirety of Kim Stanley Robinson’s oeuvre is summed up in that statement. His great collective project has been to offer individuals meaning within utopia. In a 1994 interview he told me that in a utopia people can still die tragically, can still fall in love with the wrong person. In New York 2140 he avoids that, or engineers ways around it. There is redemption. This may be both his strength and his weakness. We are pulled in to empathise with the cocky, arrogant Franklin, to dream with the boys event as we fear for them, to laugh at and with Amelia as she is both ditzy yet gets things done. But, we need to ask, where is the edge? This New York has its villains seeking to protect their high-level con but no streetcrime. The universal but not the individual when it comes to the dark side. It has ties to history, notably in the boys’ confidante Mr Hexter, this novel’s Tom Barnard perhaps, but is oddly detached geographically. Despite Amelia’s peregrinations we rarely feel this New York is a part of a larger world. Indeed Amelia’s role is most often to show off the one true science fictional element here, the balloon based cloud cities and cloud ecologies of which perhaps more could be explored elsewhere. Amelia is involved in a couple of the more physically dramatic scenes here, as are Stefan and Roberto, but these are rapidly dealt with and moved on from. There are typical Robinson set pieces, diving a sunken city, walking around describing the scenery, conversations about history, that serve to tie the land to the people. This has always appeared a key concern of his, but it doesn’t offer a broad dramatic impetus. This is not to say there’s no drama, but it is mostly subtle such as Charlotte’s interactions with her ex partner, or almost comic relief in the boys’ scrapes and near misses. The human things that continue to happen even in utopian scenarios. Even in choosing the Met Life building he alludes to history. Briefly the world’s tallest building, it replicates the Campanile in a sunken city we already know. Venice. History ties this book together. New York 2140 therefore is a science fictional attempt to take a historical perspective on very recent events. It is Robinson’s boldest attempt to achieve that fusion of individual and collective meaning that Jameson talks of. It is full of detail that do nothing to advance the story but do enhance the theme. It is a novel that couldn’t be written by any other novelist. Every chapter is soaked in familiar Robinson touchstones. This is a comfort, strength and weakness. The diving (way back to “Venice Drowned” or Green Mars); the wise old figure from the Three Californias, Frederic Jameson of course, and en passant a sly nod to Samuel R Delany alongside an overt reference to Octavia Butler. If the solutions seem almost too easy in the end, if our heroes find meaning as individuals and as collectives, well Robinson is a utopian, his optimism in the process, the journey, is infectious at times. He conveys that very human need to be a part of something, but without losing individuality. New York 2140 stands alone in his oeuvre yet is ineluctably central to it. With one slight change of tack maybe. In the past Robinson tried to argue against himself, to debate within the pages of his novels. That is reduced here, NY2140 is at its core a lecture, or perhaps a seminar, on economics. It is a book to pay heed to. “I told you so” leading into a call to arms. And it isn’t, in any meaningful sense, a climate change novel. “That is reduced here, NY2140 is at its core a lecture, or perhaps a seminar, on economics.” I agree 100%, and I think ultimately it is the book’s greatest weakness. I’ll argue that a bit more my review that’ll hopefully be up later today. I’m not sure. I think it’s arguably a quality of the work that he can make a lecture entertaining. It certainly fits the intent I perceive in the use of the Jameson quote. It’s a flawed result but the ambition of tieing the personal and global together is admirable. Agreed with that in a general way, but to these eyes the entertainment value diminished throughout the book. That Jameson quote is indeed at core of his project. Another way of putting it, or at least something connected to the diminishing entertainment value, was that to me the individuals in the book didn’t come across as real individuals, but pieces on a chessboard Robinson constructed. I admire KSR’s ambition and goals, but I’m not sure he succeeded to achieve a healthy message/story balance this time.